• How can I translate my faith into a more authentic, intentional expression of who I am? • How can I use my faith to work for a more just, equitable, sustainable and peaceful society? • How can I find my way forward in a world that often feels broken? This sums up St. Philip’s approach to both worship and community. There are no litmus tests. All are welcome: artists and accountants, Republicans and Democrats, LGBT and straight people, those of other faith traditions, and those of no tradition. No exceptions. We are a vibrant, welcoming and growing congregation, worshiping in a circa-1810 former one-room schoolhouse. 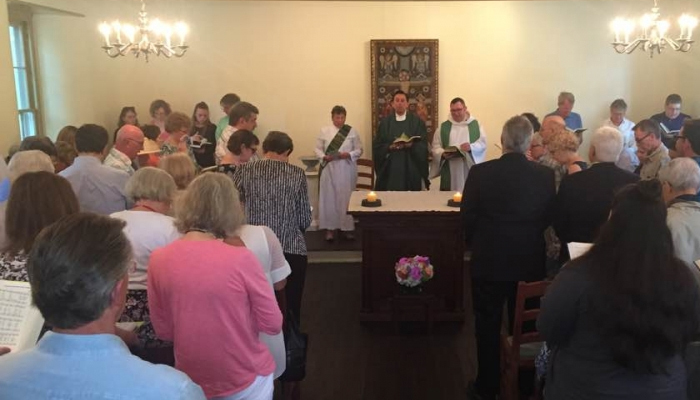 Whether it’s a normal Sunday Eucharist with about 40 people in attendance or a special mass bursting at the seams, worship at St. Philip’s has an intimacy and immediacy that is anything but institutional. Yet St. Philip’s is also a sacrament- and prayer-centered church adhering in identity and mission to the greater Episcopal Church USA. We follow the contemporary service found at www.lectionarypage.net. Service is an important part of our commitment to be “boldly incarnational” in the world — whether through cooking for the monthly Community Peacemeal dinner, writing in support of prisoners of conscience throughout the world, or simply caring for the pastoral needs of people inside and outside our community. So, come walk the walk with us. Visit us on a Sunday or a holy day. Join us for one of our service events. Take part in the discussion at an adult forum between Sunday masses. Or simply sit quietly in our memorial garden or take a walk in our outdoor labyrinth. At St. Philip’s, everyone is welcome — and we really mean it.